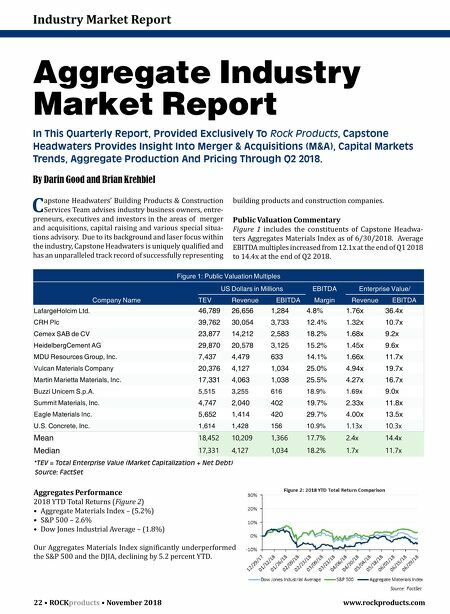 22 • ROCK products • November 2018 www.rockproducts.com Industry Market Report Aggregate Industry Market Report In This Quarterly Report, Provided Exclusively To Rock Products, Capstone Headwaters Provides Insight Into Merger & Acquisitions (M&A), Capital Markets Trends, Aggregate Production And Pricing Through Q2 2018. 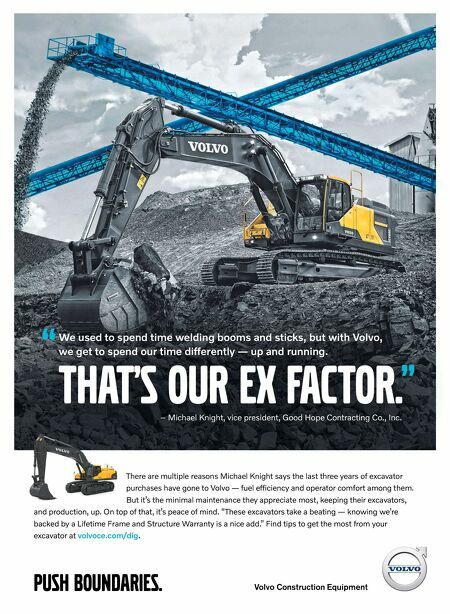 By Darin Good and Brian Krehbiel Figure 1: Public Valuation Multiples US Dollars in Millions EBITDA E nterprise Value/ Company Name TEV Revenue EBITDA Margin Revenue EBITDA LafargeHolcim Ltd. 46,789 26,656 1,284 4.8% 1.76x 36.4x CRH Plc 39,762 30,054 3,733 12.4% 1.32x 10.7x Cemex SAB de CV 23,877 14,212 2,583 18.2% 1.68x 9.2x HeidelbergCement AG 29,870 20,578 3,125 15.2% 1.45x 9.6x MDU Resources Group, Inc. 7,437 4,479 633 14.1% 1.66x 11.7x Vulcan Materials Company 20,376 4,127 1,034 25.0% 4.94x 19.7x Martin Marietta Materials, Inc. 17,331 4,063 1,038 25.5% 4.27x 16.7x Buzzi Unicem S.p.A. 5,515 3,255 616 18.9% 1.69x 9.0x Summit Materials, Inc. 4,747 2,040 402 19.7% 2.33x 11.8x Eagle Materials Inc. 5,652 1,414 420 29.7% 4.00x 13.5x U.S. Concrete, Inc. 1,614 1,428 156 10.9% 1.13x 10.3x Mean 18,452 10,209 1,366 17.7% 2.4x 14.4x Median 17,331 4,127 1,034 18.2% 1.7x 11.7x *TEV = Total Enterprise Value (Market Capitalization + Net Debt) Source: FactSet C apstone Headwaters' Building Products & Construction Services Team advises industry business owners, entre- preneurs, executives and investors in the areas of merger and acquisitions, capital raising and various special situa- tions advisory. Due to its background and laser focus within the industry, Capstone Headwaters is uniquely qualified and has an unparalleled track record of successfully representing building products and construction companies. Public Valuation Commentary Figure 1 includes the constituents of Capstone Headwa- ters Aggregates Materials Index as of 6/30/2018. Average EBITDA multiples increased from 12.1x at the end of Q1 2018 to 14.4x at the end of Q2 2018. Aggregates Performance 2018 YTD Total Returns (Figure 2) • Aggregate Materials Index – (5.2%) • S&P 500 – 2.6% • Dow Jones Industrial Average – (1.8%) Our Aggregates Materials Index significantly underperformed the S&P 500 and the DJIA, declining by 5.2 percent YTD.